Life is now officially upside down — the giant northern hemisphere economies are not emitting CO2 after all, they’re absorbing the stuff! What need of an ETS? What need to calculate carbon footprints? Are the greenies now going to reduce the poor people’s emissions? Will they blame climate change on something else we’re doing? Will they now accuse us of doing something else that’s worse than climate change, itself the “greatest challenge humanity has ever faced”? Or will they go away and save something that might need saving? Of a certainty, the Earth does not need saving. Consider the thousand-year atmospheric lifetime of carbon dioxide. Consider that the bloody poor people did this to us. Consider their crimes. Renowden’s refutation of Sullivan’s interpretation of the satellite observations of CO2 emissions is as clear as mud. Which leaves the impression that, once again, Renowden has just been flinging it around. So why don’t I believe him? Simple. If the Japanese Ibuki satellite1 had really discovered that the majority of CO2 emissions were coming from the least developed parts of the world, it would have been an absolutely enormous news story, splashed all over the media everywhere. O’Sullivan would never have got a look in on coverage of the scientific discovery of the century. Thus Renowden rests comfortably in the certain knowledge that we can trust the mainstream media to report everything we need to hear. What they don’t cover just isn’t (trust me on this, folks) just isn’t worth knowing! The fact that they carry monotonically critical reports of climate sceptics proves our belief and constant contention that they are charlatans, liars and deniers every one. So, Gareth, if the image doesn’t show CO2 emissions by location, what does it show? Total fact-checking time? About five minutes. Obviously far beyond the capabilities of Renowden. Of which “IBUKI observations help reduce estimation error of ground observations October 28, 2011 Updated” is merely the 27th and most recent i.e. reducing estimation errors of ground observations is a secondary project spin-off benefit that is enabled by the primary mission and there are several others. Among them he would have seen “IBUKI to provide analysis results of observation data (CO2 and methane concentration) February 16, 2010 Updated”. 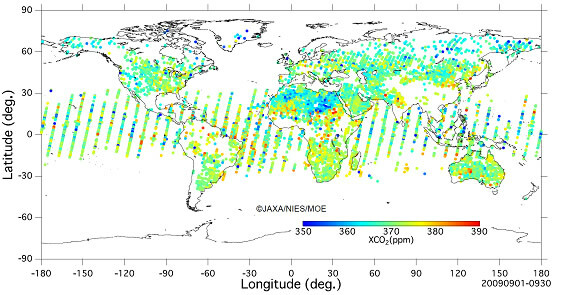 Monitoring the distribution of the density of carbon dioxide, a Greenhouse gas. So far, the number of ground-based carbon dioxide observation points has been limited, and they have been distributed unequally throughout the world. “IBUKI” will enable the precise monitoring of the density of carbon dioxide by combining global observation data sent from space with data obtained on land, and with simulation models. In addition, observation of methane, another Greenhouse gas, has been considered. Renowden’s “ridiculously easy” conclusion is easily ridiculous. Brilliant. You’re so helpful. Let’s see if Renowden offers a rebuttal to this. Again the stupidity of the ETS is evident. Also of interest (it is election time after all) are the asset sales. Oh horror! Labour would see a speeding up of the timetable and causing faster sale of land to the forestry giants. Interesting that about 7 of the top ten producers have very strong overseas connections. Anyone know how much foreign control is involved? Oh I just popped over to H. Topic and found that they have just “discovered” Matt Ridley’s speech. Heavens above, apparently it might even get a “severe debunking” at Skeptical Science. “Severe debunking” sounds like the kind of carry on that happens at English Public Schools. A “severe debunking” might raise a few ripples in the Skeptical Science bathtub but Matt Ridley swims in a much larger pond. UPDATE: Matt Ridley has graciously allowed me to repost his speech in entirety here. It follows below. If there’s one speech about the climate debate worth reading in your lifetime, this is it. Andrew Montford of Bishop Hill has also formatted the speech into a PDF file, with an improved version, better graphics, A5 format for printing by Mike Haesler here Ridley_RSA (PDF) suitable for emailing, printing, and snail mail. Distribute both as widely as possible. The lecture was delivered with slides, Dr. Ridley has sent me the ones he considers key, and I have inserted them . For background on this prestigious lecture, here is the lecture web page, and here is what RSA is all about and the history since 1754. CTG rang a bell but I couldn’t place it – HT, thanks. Pity we can’t respond but the points have been made and the feathers have been ruffled – our work is done. I feel compelled to ask for a piece of evidence to support this. Our Gareth’s just opened a thread on Matt Ridley’s talk. Ridley’s presentation is well worth a read. I’d like to see what the objections to his arguments are. (apparently Gareth has to spray his vines and is therefore unable to comment. Likewise, I have a hard afternoon crafting software for “Big Oil”). Who are the world’s worst “polluters”? 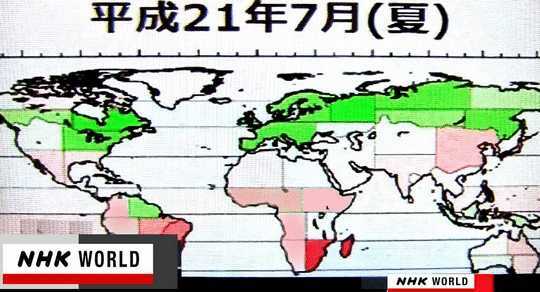 According to a new high-spectral-resolution Japanese satellite — it’s developing countries. Chiefio’s CO2 animation (linked from JoNova) is a revelation. Fluctuates between 360 – over 390 ppm with nary a hint that industrialized countries have any impact whatsoever. Most significant fluxes are the Amazon, SE Asia, Central America, N Africa and Middle East. Mauna Loa has now been relegated to obscurity as far as I can see. You wont believe your eyes sceptics – how could this be? The finger still points to China. The reason they can leave out fossil fuel emissions is because CarbonTracker North America is “based on the simulations of the terrestrial biosphere model and the assumption of large-scale ecosystem coherence. This has not been verified by observations”. See “Word of caution about high-resolution biological flux maps”.